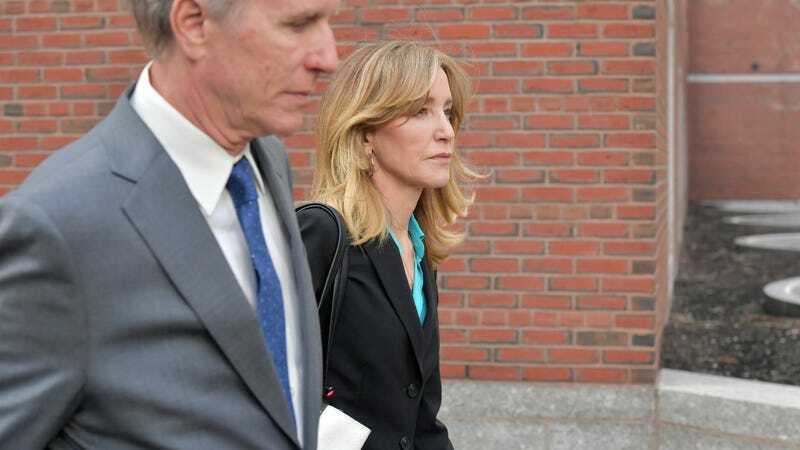 Unlike Lori Loughlin, who seems to be having some trouble with the whole “getting caught doing crimes” thing, Felicity Huffman was smart enough to agree to plead guilty to attempting to bribe her daughter’s way into college. Though a plea deal might not keep her out of jail—prosecutors are reportedly recommending she serve at least a four-month prison sentence. Ruh roh! According to the New York Times, the charges to which Huffman is expected to plead guilty—conspiracy commit mail fraud and honest services mail fraud—have a corresponding sentence of four to 10 months, per federal sentencing guidelines. Though Huffman’s sentence is ultimately up to a judge, prosecutors would like her to serve at least some of that time. They are also recommending she pay a $20,000 fine and have 12 months of supervised release. Huffman, who is currently out on a $250,000 bond, has admitted to paying a college “consultant” $15,000 to correct her eldest daughter’s SAT scores, and put out a statement last week vowing to “accept full responsibility for my actions and will accept the consequences that stem from those actions.” Though she may not actually accept the consequence of jail time, since, per her plea agreement, Huffman “reserves the right to argue” her sentence down to zero to six months. Loughlin and husband Mossimo Giannulli have both pleaded not guilty to paying over $500,000 in bribes to get daughters Olivia Jade and Bella Giannulli into the University of Southern California, which means they stand a pretty good chance of going to jail if convicted. And if anyone’s curious, Huffman’s husband, William H. Macy, has been doing some yard work. Spousal incarceration is no excuse for a shoddy lawn.